Every comics page is just an accumulation of many, many drawing choices and once a cartoonist puts pencil to paper, the world of that strip begins to solidify more and more. I think the idea of someone being able to read another’s thoughts is just about as creepy as can be and keeping Charles Xavier bald as a boy adds to sell his idea. He looks like a little humanoid alien from Outer Limits something. I suppose I also liked the idea that the Peanuts character, Charlie Brown, was a bald-headed boy so that created a precedent for my youthful Charlie X. Panel 3: I knew what I was getting into when I endeavored to begin making an X-Men comic. For one thing, I knew I was going to have to draw lots and lots of victorian mansion interiors thanks to the Xavier School of Gifted Youngsters. I made sure to get plenty of practice in before drawing the actual comic. The color scheme of this panel is noteworthy as an example of a Kubert School assignment that we first year art students had to do when studying color-theory: create an illustration using predominant cool colors or warm ones and accentuate the image with one color from the opposite side of the color wheel. I thought it was a lame, gimmick assignment as a student but rejoiced to find it applied well to this image. 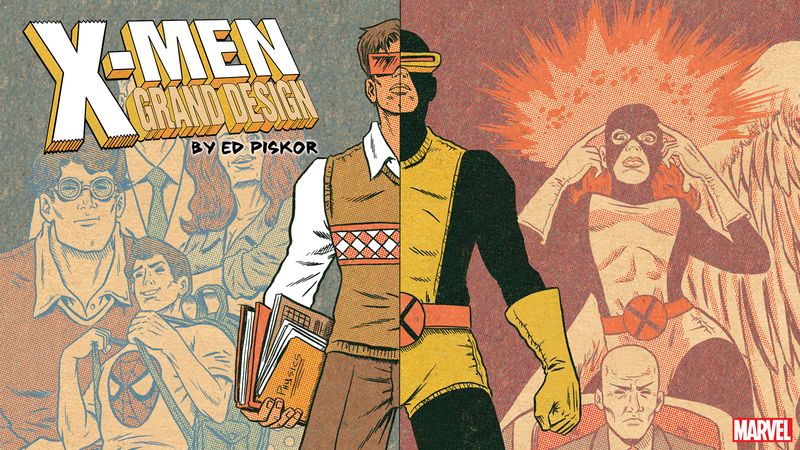 Welcome Ed Piskor back to Boing Boing (previously), where he'll be offering an annotated page-by-page look at the first part of X-Men: Grand Design, his epic retelling of how Marvel comics' pantheon of heroes came to be. Here's page 4; read the rest first — Eds. If this were an Avengers comic, Captain America wouldn't worry about protocol or mission objectives in order to save the kid being menaced by nazis. This is an X-Men book so Wolverine gets to be the antsy guy ready to pounce. It’s immaterial regardless because Magneto handles his own business. This page is inspired by the classic standalone issue 268 of Uncanny X-Men by Chris Claremont and Jim Lee set in 1941 with a young Captain America meeting Wolvie for the first time. There was also a great episode of the classic ‘90s X-Men cartoon called Old Soldiers (written by Wolverine co-creator Len Wein) that featured this dynamic duo. Both, the comic and the cartoon are equally awesome and you should check them out at any cost. The splash panel with Cap’s shield busting up the nazis is a good formal use of comics which couldn’t exactly translate into other media. I don’t often include sound effects but I wanted to slow the reader down enough to communicate that each smack from the shield was its own unit of time. When you look at that image as a whole, time is traveling at the speed of that star-spangled shield. Welcome Ed Piskor back to Boing Boing (previously), where he'll be offering an annotated page-by-page look at the first part of X-Men: Grand Design, his epic retelling of how Marvel comics' pantheon of heroes came to be. — Eds. My work on X-Men would never have been possible without the popularity my work has achieved thanks to Boing Boing publishing Hip Hop Family Tree for four and a half years. It's a pleasure to bring the Marvel mutants to the Happy Mutants for this limited serialization of X-Men: Grand Design. I created each page to function as its own unique and complete episode/strip that, when read in total, would tell a bigger story. Over the course of the next few weeks I'll be posting a page at a time, and providing a director’s commentary with every strip, to give you some insight into where my mind was when while creating the whole tale.